Firstly, I'd like to thank everyone who took the survey both in the UK and elsewhere. My thanks also go to Henry Hyde & Tim Porter for their help in publicizing the survey. Basic information like age, favourite periods, etc. People's views on the rule book and the use of the rules in games. The appearance of the third part really depends on how much time I have to devote to the survey. 96.3% of UK ADLG players are over 35 with 44.4% over 55. 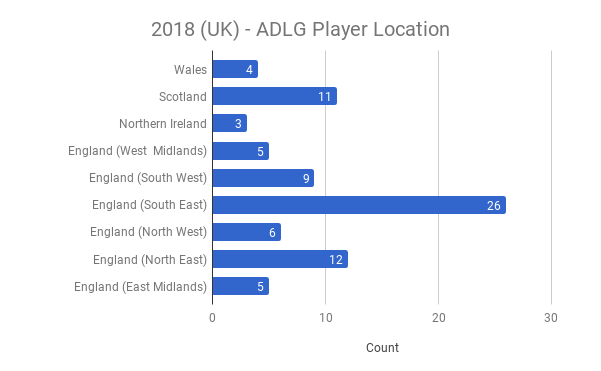 The South East of England is a "hot bed" of ADLG players. Scotland & North East England are also well represented. The Classical & Late Medieval periods are the most popular. 15 mm is the most popular scale (66.7%) with 6% playing 25 mm too. Players have played three (2.91) other rules in addition to ADLG. DBA, DBM, FOG AM v1 & FOG R were the most played other rules. ADLG has succeeded in attracting very disparate groups of players. It's worth noting that the only significant difference between the age distributions above is that the international respondents contained a greater proportion of people under 35 (11.1% vs 3.7%). The results of this survey fit very nicely with the pattern observed in Tim Porter's analysis of the UK competition scene. The three strongest regions - the South East, the North East & Scotland - accounted for 60.5% of UK responses. The response from the other six regions was quite modest. I wonder if it's difficult to get a game in these regions or perhaps they didn't take the survey? 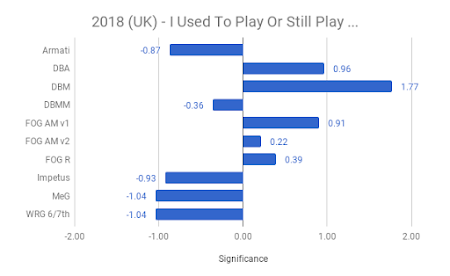 For UK players the Classical period wins hands down favoured by 30.9% of respondents. The next most popular period was the Late Middle Ages (22.2%), followed by the Roman period (17.3%). The top three periods accounted for 70.4% of all choices. There's a big difference between the UK and the International respondents. The latter favoured the Roman (29.6%), Classical (24.1%) and Dark Age (20.4%) periods with top three total of 74.1%. 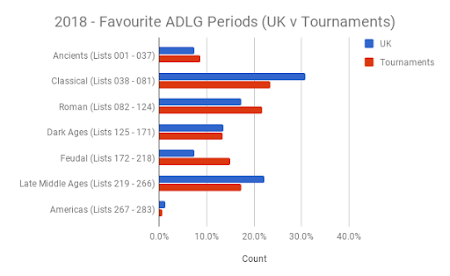 I've also been able to compare the results of this survey with the ADLG player & army database which currently has 27,670 entries for the armies used in tournaments around the world. The different preferences of the two data sets are nice and clear. No surprises here with 15/18 mm by far and away the most popular. The UK & international distributions were broadly similar although the UK has a few players (6) using 6 mm figures. You may have noticed that the total number of scales (86) is greater that the number of respondents (81). This is because some 6% of respondents played in more than one scale; almost exclusively 15 & 25 mm. In contrast, 10% of international respondents used more than one scale. The first thing to point out is the importance of the pioneering DBA & DBM in the UK. 66.7% have played (or still play) DBM and a further 49.4% have played (or still play) DBA. 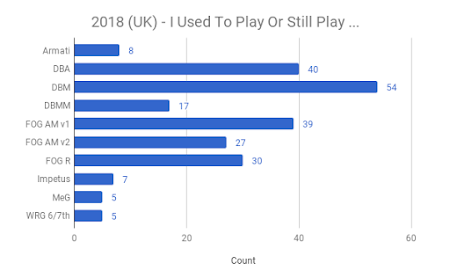 Nearly half (48.1%) of the UK respondents had played (or still play?) FOG AM v1. This pattern is essentially the same for the international respondents. In the above a score of more than 1, or less than -1, has a 65% probability of not occurring by chance. Scores above 2, or below -2, have a 95% probability of not occurring by chance. The presence of DBM in players' rules history is clearly significant. I looked at the favourite rules data in more depth focusing on the "big battle" competition sets: DBM, DBMM, FOG AM v1 & v2. The transition from DBM to DBMM & FOG began in 2008 and I was interested to see if there were any patterns in the rules UK players used before they started playing ADLG or indeed still use alongside ADLG. There are two main groups: those that have played (or still play) DBM as well as ADLG and those that have not. Followed the path from DBM to FOG AM v1 & v2 to ADLG (14.8%). 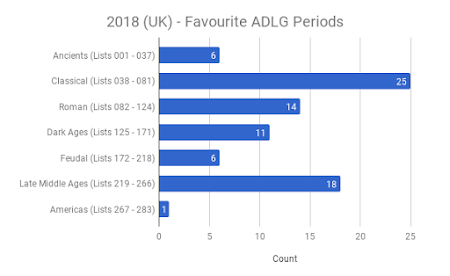 This assumes that players change rules in a linear fashion which isn't always true but looking at it this way may well explain why ADLG has built such a strong following relatively quickly: it appeals to very disparate groups. 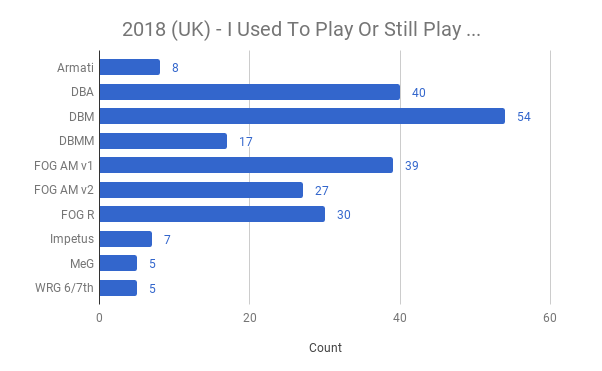 In the UK ADLG has attracted significant numbers of former DBM players who weren't interested in either DBMM or FOG AM; players who've played DBM and both versions of FOG AM; and players who'd never played DBM, DBMM or FOG AM. Of course they may have played other games but it's still a broad appeal. Coming next: Part 2 - Player ratings, their experience and why they play ADLG.